In just 20 minutes, Revitalizing Mask offers soothing care and renewal to all skin conditions. The appearance of redness or blemishes is diminished, pores are visibly refined and skin appears even and toned. Skin glows with a healthy radiance. Formulation: Quince seed, anthyllis and chamomile extracts rapidly support the skin’s processes of renewal, helping to maintain moisture, visibly minimize pores and calm the appearance of redness and irritation. Nurturing jojoba, apricot kernel and wheat germ oils clarify and smooth skin. Love the revitalizing mask. Makes my face very soft and a bit more luminous. This mask made my face feel refreshed and soft, started out with a sample then purchased full size! I like this mask which I use after the cleansing cream once a week. 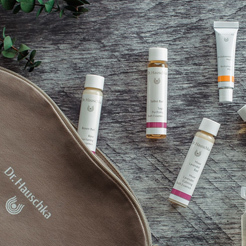 I have been using Dr Hauschka products for at least 10 years and I will stay loyal making the necessary adjustments as my skin matures. Love how my skin feels after using this product and wrinkles are less noticeable because of the hydrating effects. I genuinely look better the morning after using this mask. My skin looks brighter and healthier. Just the right amount of thickness and nurturing without being clogging. Can also be used overnight. I’ve been using it for years. Makes my skin feel soft and smooth. I also sometimes mix it with my day cream during the winter, when my skin is really dry. I love this mask! Love this product.I leave it on overnight. My rosacea has improved from using these products. I love how this mask smells! It moisturizes my skin so well without overdoing it. Fabulous! I have sensitive skin. I use the soothing cleansing milk, clarifying toner and then the revitalizing mask as a moisturizer right after spraying the toner. The combo of the toner and mask do not irritate my skin. Not only is my skin less red but less oily. I highly recommend to anyone who has sensitive skin. This is not typical mask but another perfect Dr. Hauschka product. At first I didn’t want to try the sample I received since masks usually irritate my overly-sensitive combination skin. However, I was pleasantly surprised. This is a wonderfully soothing, moisturizing mask! It left my skin quite soft, diminished the appearance of pores, and left my skin feeling very balanced (it moisturizes the dry patches and also dries the excess oil)! It smells good too! This mask brightened and calmed my skin leaving it silky to the touch! My skin glows when I use this regularly and it seems to be the only product that helps my skin stay supple. I'm a 50 year old fair skinned woman with highly sensitive skin and sun damage. My use of this product has coincided with a dramatic change in the appearance of the skin on my face. While women 10-20 years younger than me are showing signs of wear and tear, my face appears virtually wrinkle-free. I apply this product on top of a heavy application of natural moisturizer. Soap never touches my face. There, I've shared my secret! I received this mask as a sample and LOVED how it made my skin feel: So soft and moisturized. I immediately purchased the full size along with the entire line formulated for my skin type. All of the products work fabulously. I've been missing out all these years, but I am grateful to have Dr. Hauschka products in my daily regimen now. My skin has not looked this good in years. My face felt hydrated after using this mask but I didn't notice a difference in pores any "glow" after... not sure if I would repurchase. Loved what this mask did for my pores and overall look. However, since I am sensitive to chamomile I can't use it very often or else my face itches. So, once every few weeks is all I can handle. I use one of the other masks instead. I have very sensitive skin and this mask always calms it like magic. I like to use this Mask after using the Clarifying Clay Mask and leave it on through the night, I wake up to truly happy, calm, even skin! I like to use Revitalizing Mask after traveling. Dry air in the airplanes takes a toll on my skin and this mask does wonders! It feeds my skin, refines it , and the skin feels revitalized again. I follow the suggested regimen and the skin bounces back in 20 minutes. Makes My Skin Look Great! This mask makes my skin look amazing. I have also used it as a moisturizer during the daytime. I will often wear it alone without foundation and it evens out my pores and skin tone. When my skin is acting up this is my go to for that extra boost! This Revitalizing mask is well named! I am using the mask and love how hydrated it helps my face feel! I also mix it with Rose day cream 3-4x a week. My face has a healthy glow ! Received a sample and now I'm hooked. Skin feels soft and hydrated. I was leary of masks because the last time I tried one, many years ago, I had to mix the powder myself. So glad they are now in a tubes. I'll be ordering again. I received a sample of this mask, it felt amazing on my irritated skin, and I used it under my moisturizer in the morning for added dryness relief. I immediately ordered a full size of the mask. I received a sample of this mask after ordering a Dr Hauschka moisturizer and after just one use I was immediately impressed! My skin was plump, soft, even, glowing, everything you could ever ask for, I went on the website and immediately ordered me 2 masks. I received this as a complimentary item with my last order, and I love the way it feels. It is a very light moisturizing mask. I used it's after my clarifying steam bath and clarifying clay mask. Great addition to my regimen. I tried this at a local store and got a better Result than the firming Mask, so hydrating is Key. I really can tell a difference after using this mask. My face feels really smooth and fresh after using. Sometimes I use it as a night cream and use nothing else but a thin layer and I wake up in the morning with happy skin. My favorite mask from Dr. Hauschka (though I use them all.) Perfect pick-me-up on days skin needs a lift both visibly and feeling-wise. Skin is smoother, younger, tighter and energized-looking. Thank you for making this mask! I like this mask as it smells great and feels restorative. Unlike other Dr. H products, I don't notice any difference in terms of how my skin looks and feels after treatment. I tend to like thicker products (like the Hydrating Mask and Rose Lotion), but if you prefer lighter masks, this would be a good choice. I became interested in this product because this is the only mask I encountered so far that explicitly instructs to apply it to the undereye area. I always use it after a nice steam bath and clarifying clay mask application. Absolutely wonderful - skin never felt so great during winter time! This mask is very convenient and it does soothe the skin. overall, good product to have in handy. I use this twice a week to keep my skin hydrated. I love the supple smooth renew look on my skin. I am usually not a mask user, but since I heard so much about this gem online, I wanted to give it a try. I am so glad I did. It is lovely. Minimal fragrance and refreshing to the skin, I had a glow that was comfortable. My skin felt wonderful. A new favorite of mine from the Dr. Hauschka line. The revitalizing mask is a game changer. My skin is finicky - it's really oily in the summer, very dry in the winter, and breaks out very easily. This is one of the only products that has truly calmed and healed my skin. I use it as a day cream in the winter. Plays in my head every morning when I put this product on, and leave it OVER NIGHT. Gasp! I know. I'm supposed to take it off earlier, but one night I put this on, and drifted off to sleep. I swear my skin felt even better. So, now I do that, and I wake up feeling like a dewy princess. At my age, my skin requires frequent use of masks, oils, and serums, in addition to the regular toners, lotions, creams, and sunscreen on sunny days. This mask is perfect for giving my skin a big does of nourishing herbs, minerals, and oils when my skin is having a hard time trying to keep up with environmental damage done to it by the abundance of environmental toxins in modern civilization. I always bring it when traveling because it quickly helps my skin overcome travel stress. I feel like it's working will buy more! I often wear a thin layer of the revitalizing mask under my Rose day cream for an extra layer of moisture and protection during the cold season. It is the perfect combination for my sensitive skin. I have been using this mask for over 15 years. I apply it before I go to the gym at least 3 days a week. It smells wonderful and gives me a beautiful glow! I have every product for my age group. This completes the set. ALL products are terrific! This has been my go-to Dr. Hauschka mask for twenty plus years. I can use it all over my face for that special glow or just a dot on a blemish overnight to clear up my entire face. If you're looking for a product that near-instantly can revitalize your skin so it looks and feels healthy and glowing, this is it. Use it before a special occasion to get your skin looking its best or use it after you've had a long night to help your skin recuperate. It's really that good. After cleansing and toning, apply a generous amount of Revitalizing Mask to the face (include eye area), neck and décolleté. Remove after 20 minutes with a warm, damp cloth. For best results, apply while skin is still moist from toner. We recommend using Revitalizing Mask once to twice a week. To soften the appearance of blemished or scarred skin, or skin prone to redness, supplement your day cream with Revitalizing Mask. Mix a small amount of each in your palm then apply as a thin layer in the morning. Water (Aqua), Pyrus Cydonia Seed Extract, Alcohol, Glycerin, Anthyllis Vulneraria Extract, Prunus Armeniaca (Apricot) Kernel Oil, Simmondsia Chinensis (Jojoba) Seed Oil, Borago Officinalis Extract, Cetearyl Alcohol, Arachis Hypogaea (Peanut) Oil, Chamomilla Recutita (Matricaria) Flower Extract, Bentonite, Triticum Vulgare (Wheat) Germ Oil, Triticum Vulgare (Wheat) Bran Extract, Daucus Carota Sativa (Carrot) Root Extract, Propolis Wax, Fragrance (Parfum)*, Limonene*, Geraniol*, Linalool*, Citronellol*, Citral*, Eugenol*, Farnesol*, Lysolecithin, Xanthan Gum, Chlorophyllin-Copper Complex (CI 75810). When first starting a new regimen of Dr. Hauschka Night Care, complement Renewing Night Conditioner with Revitalizing Mask, ideally in the early evening. 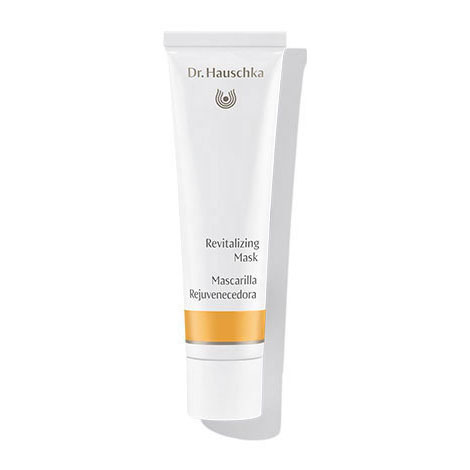 To soften the appearance of scars or to refine enlarged pores, apply in a thin layer of Revitalizing Mask under your Dr. Hauschka moisturizer daily for 4 to 6 weeks.